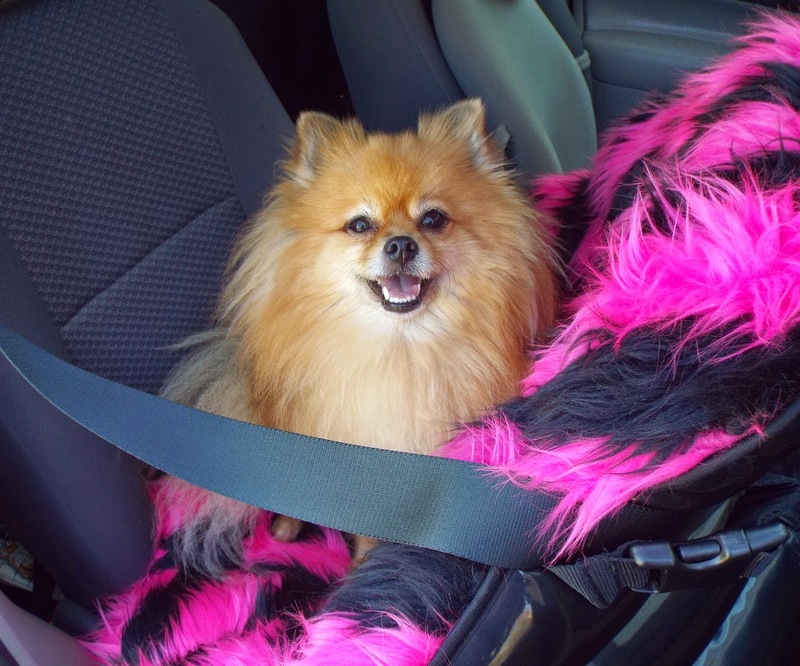 Pepper's Paws: BlogPaws 2013 - The Adventure Concludes & Swag Bag Giveaway! 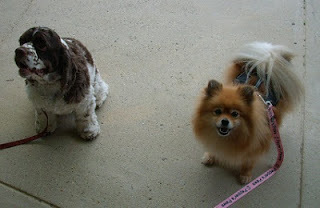 BlogPaws 2013 - The Adventure Concludes & Swag Bag Giveaway! 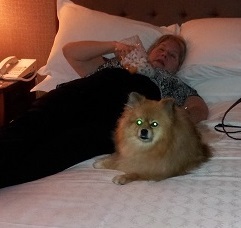 Saturday was the last day of BlogPaws. I finally allowed Mom to take my picture with some of my pals. BOL!! This is Dexter from Fidose of Reality! Carma and I thought it would be funny to to refuse to look at the camera. We'd look left - we'd look right - sometimes together - sometimes opposite of each other. Eventually we looked at our moms and allowed a face photo. BOL!! I was smitten at first sniff when I met Preston Casanova. He is one handsome Pom! I posed with some flat pals too. 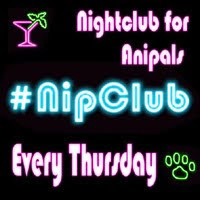 TinyPearlCat won a prize from Zero Odor in the Kitty Lounge! We surprised our mom's when when Davinia (of Two Little Cavaliers) and I touched noses. Both of our moms were very happy. BOL!! JR from Whirlwind of Surprises and I managed to get close enough to fit in a photo. I was happy to see Plush Cokie. 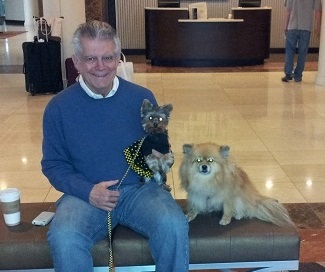 We met last BlogPaws. He watched over me while I snoozed in my stroller. If you look closely, you can see my beautiful new dress from Spoiled Pup Boutique in my napping photo. Mom hasn't been able to find any photos of us on the red carpet yet. We were in a weather video with Schmitty, Ron, Elly, and our #PetChat pals! I posed for a photo with Schmitty and Ron on Sunday morning. I was sad that everyone was leaving. Kona, Carma, and I are three hard working girl dogs! All three of us are Medical Service Dogs. I was so happy that Emmy was still there! I cuddled on her bed with her while Mom started packing our things. I adore Emmy. She knows how to really love a dog (and all other animals too). Emmy, Mom, and I brought Scruffy to the Smithsonian Museum of Natural History. Scruffy was very curious about those big lizards (Dinosaurs). Emmy posed with the huge Elephant in the Rotunda. The Hope Diamond is beautiful, but it has a scary legend (curse). On Sunday night, Mom packed up all of our stuff. We left on Monday and boarded a train to go home. Scruffy came home with me on the train. After we left the train on Tuesday morning, we had a long car ride to get home. Our little car was packed to overflowing - as usual. BOL! 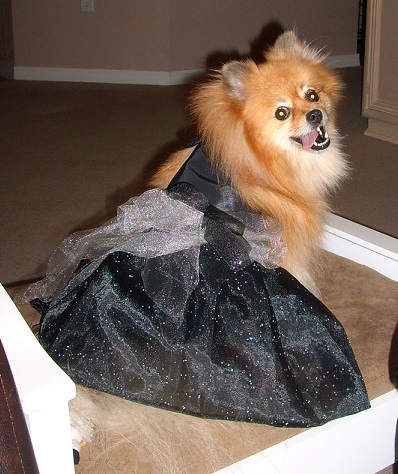 You can see my beautiful Spoiled Pup Boutique Black Tie Lizzy dress very well in this photo. Who wants to win a bag of swag? 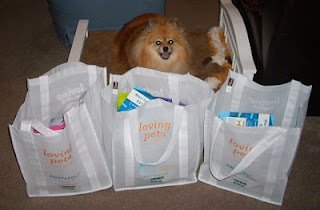 I am giving away 3 bags of BlogPaws swag! BlogPaws swag bags may contain items from any of the pawsome BlogPaws sponsors. Log into the Rafflecopter form for the giveaway entry options. Giveaway Disclaimer: I did not receive any compensation for this giveaway. I was given a free product to giveaway. I am not responsible for lost/missing prizes. The opinions in this giveaway are my own and not influenced by any outsider . I receive no additional benefits for talking about the product or company. Hi Pepper!! I would love to win the big dog or cat BlogPaws Bag!!! Good seeing you again. JR was very happy to have met Pepper Pom! It was nice to see you and meet JR. Maybe I will be calm enough to pose for a photo with BabyPom next time! What a lot of great photos, Pepper! Is Dexter a cocker? Just fur the record (heehee) I weigh about 26 lbs! Aww thank you for the meet and greet! I hope that you and Davinia can hang out again soon. We sold all of our BlogPaws Swag at a Yard Sale on Saturday to raise money for the local Humane Society. Looks like you took home way more then we did. Next time we will have to go around with you to check out all the Sponsors. Pepper I love your black dress but was wondering why they had you three medical dogs spread apart like that for the photo. You looked absolutely Stunning sitting with Ron and Scmitty. You did an excellent blog about meeting and posing with friends. BOL!! We are far apart because that's how the lobby furniture was arranged. :) Thank you! Oh Pepper, you look beautiful in your gown. I so wish I was there at BlogPaws to meet you and your mom. Maybe next time....OH! Even better, at BarkWorld! I will bring one of my Spoiled Pup Boutique dresses to wear at BarkWorld ;) I look forward to meeting you in furson! Well Hi there Pepper - we just called on by to say hello after Oz mentioned you on his page. Looked like a great event you attended. Hello! Nice to meet you! Oz is a pawsome pal :) I had a wonderful time at BlogPaws. Thank you for reading my blog, I hope you enjoy it. Woo hoo! I'd love to win the kitty swag bag. I wonder what's in it? I'd need the big doggie bag cuz tulips a BIG girl :) I LOVE your sparkly black dress! I would like the big dog bag for my two large dogs. My favorite post was the Hear Doggy! Toys by Quaker Pet Group - Product Review & Giveaway. I had to get one of these for Artie because the constant squeaking of his toys was driving me nuts. Now, he can go to town and I can think. Hello Pepper--we aren't you full of suprises. would love to enter to win the SMALL DOG and CAT swag bag. Many thanks! Glad you had a great time at BlogPaws! What a beautiful dress! 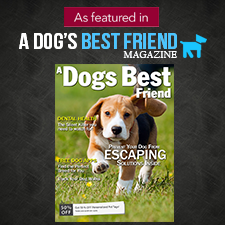 You look gorgeous : ) I'd love to win the big dog or small dog BlogPaws Swag Bag. Big Dog! Vlad & Barkly's favorite no-kill is full of big dogs that always appreciate everything they're given when a food-run is taken. 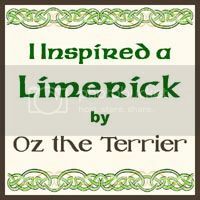 The BlogPaw posts were great! I Would Love The Small Dog Swag Bag For My Rascal! I would really love to have the Big Dog Swag Bag for my Boxer Loki :) but I also have a new kitten we are picking up next week so if I don't win the Big Dog Swag Bag I would like to be in the running for the cat bag as well! Thanks for the chance to win! Mrs. Nesbitty says she adores your dress!